In small amounts, the natural stress response can be super helpful and when working properly, it helps us stay energized, alert and focused. However, constant moderate or high levels of stress has been known to cause overwhelm, trouble sleeping, impaired judgment, affect memory, exacerbate medical conditions or inflammation, and even increase chances of depression, just to name a few side effects. So not only is high stress annoying as hell, but chronic stress is actually detrimental to your mental and physical heath. Not OK.
What triggers one's stress is as unique as the individual, but the feeling is always the same. The stress response, also known as our “fight/flight/freeze” response, is a natural protective reaction to what our subconscious mind perceives as a danger. When our primitive brains developed this response, our species was not at the top of the food chain and always had to be on alert to avoid becoming lunch. You can see how this reaction would come in handy to prevent us from simply walking into the open eager jaw of a hungry saber tooth tiger. In present time however, it is not (too) often that we are attacked by a real threat to our lives, and yet, our brains (and therefore our bodies) react as if our very lives depend on that project you haven’t started or that huge bill that’s due before payday. The fact is, stress has become a natural, knee jerk reaction in life. Luckily, I've put together a handy list of amazing resources to help you reduce your stress level and feel better in 5 minutes or less! You've heard how important breath is before, but this is one of the most important things I can offer you. Remember the last time you felt really relaxed: how were you breathing? That's where you need to get to in times of stress. Practicing slow, deep breathing immediately lowers your heart rate and blood pressure, and sends a message to your body and mind to relax. *A quick easy technique for this is to breath in through your nose slowly, hold that breath for 4-7 seconds, and exhale twice as long as the inhale. Repeat this for at least 3 breaths, and notice how you feel once complete. You could go get a mani/pedi or take yourself on a nice date, but for a quick pick-me-up, it can be as simple as indulging in a nice sweet treat! Yummy foods like dark chocolate, Greek yogurt and citrus have shown to reduce cortisol (the stress chemical) levels and boost your mood right away! Give it a try! This may sound like one of the harder ones ("Lynnsey, if I could do that I wouldn't be stressed in the first place! "), and I totally get that. But I'm not talking about forcing yourself to think about something else; I'm talking about actually experiencing the ideal outcome you want-- feeling it in your subconscious mind and intentionally creating the mood of your choice. 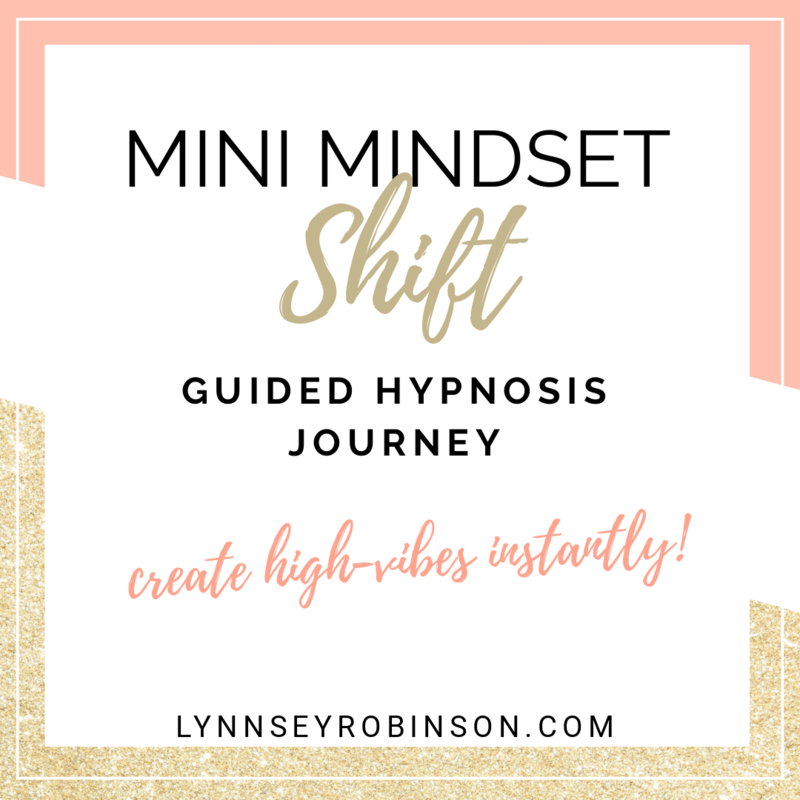 You can do this on your own through meditating or creative visualization, but I've taken all the work out of it for you with my quick "Mini Mindset Shift" guided hypnosis. This will help you step out of your current constricting state of mind, and allow you to create your ideal emotion that will lovingly carry you throughout your day! Pinky promise. There's always a benefit to changing your environment in times of stress, and there's no better environment than nature! We are designed by and a part of nature. It's where we come from, so it's only natural (pun intended) that we will rediscover and rejuvenate our well-being there. Just being outside reduces anger, fear, and stress and increases pleasant feelings within seconds. So get outside, feel the sun on your face, put your bare feet on the ground. You'll be amazed at what just a few minutes can do for your day and your entire mental state! Whether its your to-do list that has you biting your nails like a mad woman, or just an onslaught of stressful emotion all at once, writing it down will immediately get you feeling better. There are a couple reasons this is so effective: 1) All that data tying knots in your brain gets out and onto the paper, freeing up your mind from the clutter and immediately calms you down. 2) Seeing it laid out in front of you in black and white will help you use your logic and critical thinking to see what's important NOW, and what can wait. It also helps you sort out and work through why your feeling the way you are, deepening your understanding of yourself, which is always a plus. Really ANY type of exercise or physical activity increases endorphins, which is our body's natural stress killer and good-vibe-bringer. Dancing really never feels like working out, and no matter how hard you may try an fight the feeling, it will ALWAYS put a smile on your face. It's fool-proof! Even dancing for as little as one song on the radio will have a crazy positive effect on your mood and outlook (but good luck just stopping at one song). What are your favorite ways to de-stress fast? Which of the methods mentioned above have worked for you?